We would like to announce the next rotation of things on display at the London Gallery location in Shirokane. 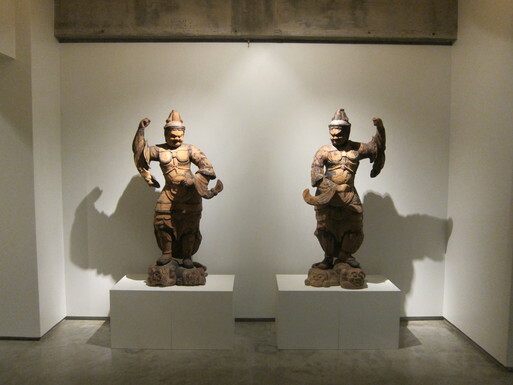 This time we will be displaying large wooden Buddhist sculpture, as planned for the Tokyo Art Fair 2012. 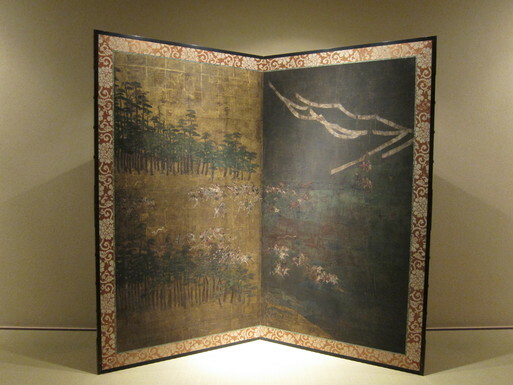 We will also be showing this folding screen for the first time. This is a two-fold screen. The left side is covered in gold leaf, the right side in silver leaf, over which a battle scene has been painted. It is a very rare theme called Inji uchi, which was a sort of boys' game banned in the Momoyama period that involved throwing stones at members of the opposing side. Please be sure to stop by the gallery to have a firsthand look at this extraordinary piece. The Shirokane Art Complex will have a joint reception on Satruday March 3rd, from 8:00pm (including 1F Kodama Gallery, 3F Yamamoto Gendai, 4F London Gallery). We hope you will come to see us at that time. Certain objects on display will rotate during the exhibition period, and we thank you in advance for understanding. Due to ongoing photography, we would like to announce that London Gallery in the Shirokane Art Complex will be closed on the 24th of February. Thank you for understanding, and we hope you will visit us here again soon.